This amazing shot of Bentleyville is credited to local photographer, Tony Rogers. To see Tony's photo web site, click HERE. Thanks, Tony! May you all enjoy the season. Good health and happiness in 2010! The other day I found myself teaching traditional Christmas carols to three-year-old twin grandsons. They are at the late-toddler stage in life when they begin to understand the true meaning of Christmas, which is to say the birth of Rudolph the Red-Nosed Reindeer. Rudolph, with his nose so bright, looms large among this set – no surprise there. But I hasten to sternly remind them -- and you -- that there’s more to Christmas than “Rudolph the Red-Nosed Reindeer.” There’s “Frosty the Snowman,” after all, whose impact on Christendom almost, but not quite, parallels Rudolph’s. With “Rudolph the Red-Nosed Reindeer” looming so large in children’s minds at Christmastime it hit me in the impromptu carol-singing session with these youngsters that this disfigured reindeer (remember: all of the other reindeer laughed and called him names) could serve as a teaching vehicle for other songs of the season. 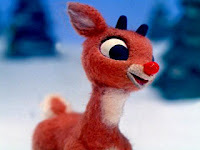 Kids really understand Rudolph, and, the thinking went (mine), he could help expand their minds in learning other carols. It started when we veered from “Rudolph,” the lyrics of which were already well known even to the children, and embarked on “Frosty the Snowman.” Unfortunately, none of us could remember the second line of “Frosty,” so we substituted “had a very shiny nose.” Worked beautifully. Of course (it goes without saying) in children’s eyes nothing matches “Jolly Old St. Nicholas” himself, whose arrival up on the rooftop, click, click, click, and descent down through the chimney on Dec. 24 or thereabouts is the highlight of the holiday season, eclipsing even Black Friday. “Jolly Old St. Nicholas” had a very shiny nose works pretty well, you’ll find if you try to insert it. After all, he’s been flying around outdoors in winter like the down of a thistle. Of course his nose is shiny and as red as a cherry. In fact I came to realize that, “had a very shiny nose,” can be adapted to almost any carol, sometimes with a crowbar, but what the heck, it’s Christmas. Few people know, for example, that “Good King Wencislas” had a very shiny nose. Well, if he didn’t he does now around our place. “We Three Kings” -- the ones of orient are – now have very shiny noses, it turns out. And why not? They’ve traveled a long way in a very cold season lugging spices and gold. I hesitate to bring God up in such a secular season, but those “merry gentlemen” He was resting (something I could use) and who had “nothing to dismay” each now has a very shiny nose in our version. You get the idea. I admit it’s difficult to adapt “Deck the Halls” to include a very shiny nose, but surely as “don we now our gay apparel” we can have very shiny noses all around. Fa-la-la-la-la, la-la-la-la. Hear Gene Autry sing the original version of "Rudoph the Red-nosed Reindeer" HERE. Saturday from 2-4 I'll be in Grand Rapids at the Village Bookstore signing copies of my book, Cooler Near the Lake. I hope to meet some great folks who live north of Duluth. Hope you can stop by and say hi and check out the book. I've been told that the variety of topics and shorter writings in each column help make this book ideal for bathroom reading. So come on down and do your Holiday gift shopping or buy a book for that special room in your house! Sunday from 2-3 I'll be doing my final Holiday book signing at Barnes and Noble at Miller Hill Mall in Duluth. Stop on by, Duluth shoppers! The 3-year-old boy joined a host of other children in the front of the church for the Christmas season children’s sermon, popular in so many congregations these days. I heard this second-hand, but I understand that somehow the minister was relating a Christian message using timepieces – analog, digital – to illustrate the points. Holding up a digital clock, the children were asked if they knew what it was. The 3-year-old perked right up, and answered that such a clock was used to time his “time outs” at home. Right he was. The boy is my grandson, and I’m happy to report he garnered his first laugh from an assembled audience, and he told his parents later that he liked it when everyone laughed. I know how he feels. I had a similar experience at an early age, although I think I was somewhat older – maybe six or seven. It too was in a church program and I was on stage being interviewed by an adult woman who asked me various questions, one of which was, did I like music? I said I did. “What kind of music?” asked the interviewer? “Certainly not Shostakovich,” I recall saying. Big laugh from the audience. I was the talk of the church. Why Shostakovich? It was the beginning of the Cold War, and in those days anything Russian was said to be bad. I don’t know where I’d heard about the Russian composer Dimitri Shostakovich, but if he was Russian he must be bad, my juvenile mind had determined. Still, getting a laugh from an audience makes an impression on you. One of these days, that 3-year-old will know how to tell all kinds of time and take it for granted, but he’ll probably always remember the Sunday he made the congregation laugh. As for me, I grew to love the music of Shostakovich almost as much as that of Prokofiev – long before the Cold War ended. I’ve been going around signing copies of my book, “Cooler Near the Lake (Fifty-two Favorites From Thirty-Four Years of Deadlines),” that came out last year at this time. It’s still in the stores, and I have a couple more signing dates next weekend, one in the Village Bookstore at the Mall of Grand Rapids, Minn., (not to be confused with the Mall of America), 2 to 4 p.m. next Saturday, Dec. 12, and a final session at Barnes and Noble in Duluth, 2 to 3 p.m. next Sunday, Dec. 14. Then I can relax, fly back to the North Pole (not to be confused with the tavern on Raleigh Street in West Duluth) and glide through the rest of the Christmas season as though on a one-horse open sleigh, knowing I have done my duty to the reading public. But having already completed book signings at Northern Lights Books in Duluth’s Canal Park, the Bookstore at Fitger’s in Duluth’s Fitger’s Brewery Complex and at the Blacklock Gallery in Moose Lake, sponsored by the Moose Lake Area Historical Society, I feel I should offer some sound advice to readers planning to attend my two remaining signings. Be careful. It’s getting cold outside. If you are planning to arrive the previous night to secure a place in line outside the mauls…er…malls, bring warm clothes. Set up tents and include arctic sleeping bags in your gear. We don’t want anyone getting frostbite waiting for a signed copy of a book partially – but only partially – devoted to cold weather. You can’t judge a book by its cover. Once the multitudes are allowed inside the malls and line up before my signing table, be aware of the protocols associated with such occasions. Just as fellow author Sarah Palin, former governor of Alaska, doesn’t mind if readers at her signings call her governor (people still call Jesse Ventura governor, after all), I don’t mind being addressed as “Mister” or “Sir” or “Your Excellency.” Still, “Jim” is fine. That’s my name, but don’t wear it out. Perhaps you’ve heard Ms. Palin is traveling around signing copies of her book, “Going Rogue.” Just like me. She was at the Mall of America on Pearl Harbor Day. There might be irony there, I don’t know. The Moose Lake Historical Society was going to invite her to our signing session there, but there’s a big statue of a moose at the edge of town and they were afraid she’d shoot it. “Cooler Near the Lake” sold pretty well last year for a book issued at the dawn of a period in our history that will forever be known as “The Great Recession,” and described by a fellow writer from England named Wm. Shakespeare as “…the winter of our discontent.” But there are a few left for this year – hence another round of book signings. I always enjoy meeting members of the general public at these events, and hope to see you at one of them. Remember, though, don’t take chances lining up outdoors in the cold weather, and, oh what the heck, you can call me “wonderful counselor,” although I admit I am one of the few who never went to law school. I've got a busy weekend ahead promoting my book, Cooler Near the Lake, at area book events. Hope you'll have a chance to stop by at one of these holiday book events to say hi and do some Holiday shopping. And... pass the word to your friends and neighbors! I'll be at the Moose lake Historical Society Annual Book Event from 10 am to 1pm. Many area authors (Kathy Wurzer, Tony Dierckins, Chuck Frederick and others) will take part in this fun event. Coffee and holiday treats will be served. Click HERE for more information in the Pine Journal. I'll be signing books and greeting customers at the festive Fitger's Brewery complex. I'll be at the Bookstore at Fitgers from 1-2 pm. I'll move downtown later on Sunday afternoon to join another festive event held at the Spiritual Deli located at 3 W. Superior St. Holy Cow Press and X-Communication publishers are hosting a Holiday Book Sale from noon to 4 pm. Ten percent of profits will go to our local CHUM program. I'll be joined by local authors Jim Johnson, Anthony Bukoski, Jim Perlman, Chuck Frederick, Denny Anderson and Tony Dierckins. Refreshments will be served amidst a casual atmosphere where you can meet authors, buy signed books and browse for Holiday gifts. I'll be at this event from 2:30-4 pm on Sunday.